Every year more than 4.2 million young people, ages 13 to 25, experience homelessness in the United States. 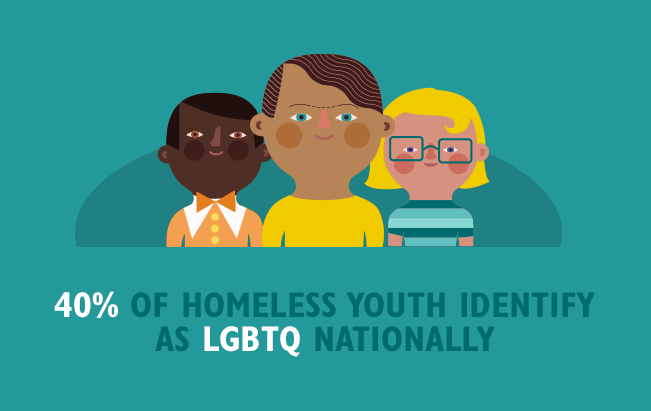 Overwhelmingly, they are youth of color and young people who identify as LGBTQ. We believe that every young person deserves a safe, stable place to call home, and we’re working to make that vision reality. To end youth homelessness, we need to both prevent young people from becoming homeless and respond rapidly, with culturally appropriate, trauma-informed services when a young person becomes unsafe or unsheltered. We work with our partners to help schools, child welfare services and the juvenile justice system recognize the early warning signs of young people in crisis and prevent homelessness. We also work to ensure the community has the systems and tools in place to respond effectively if young person does find themselves in crisis. She spoke with the calm and confidence of a seasoned political veteran. Yet Trai is far from typical in the halls of government—one reason why she is such an effective advocate for preventing and ending youth homelessness in King County. Five years into our work on youth homelessness, the Raikes Foundation team reflects on challenges, successes and lessons learned from our work to-date in King County. Our hope is that this document will inform other public and private funders as they set out on their own journeys to support young people facing homelessness in their communities. Missed Opportunities is the first in a series of research-to-impact briefs by Chapin Hall at the University of Chicago on understanding and addressing youth homelessness. This brief is part of Voices of Youth Count, the most comprehensive study ever done on the challenge of youth homelessness in the United States. Schools play an integral role in preventing youth from experiencing homelessness and supporting those who do. Commissioned by the Raikes Foundation, this report by Civic Enterprises and America's Promise Alliance draws on available data and first-hand testimonials to outline what must be done to properly support schools in this important work. Washington's Office of Homeless Youth has put together the state's first plan to solve youth homelessness. The report outlines the state's current capacity, as well as assets and gaps, and makes recommendations to end youth homelessness. This grant supports LCYC’s Legal Services Partnership for Youth, a program that provides pro bono legal support for young people experiencing homelessness. This grant supports A Way Home Washington’s efforts to prevent and end youth homelessness in Washington State. This collection of grants to the Rapid Results Institute, Nexus Youth and Families, YouthCare, the Reach Center, and Spokane Housing Authority facilitated the 100 Day Challenge in Washington state, an initiative to house as many young people as possible in 100 days by piloting innovative solutions. This grant supports Civic Enterprises’ work on student homelessness, including research, policy development and analysis, and communications. This grant provides ongoing support for the Youth Advocates Ending Homelessness, a leadership development program that engages youth who are currently experiencing or have previously experienced homelessness to engage in efforts to prevent and end youth homelessness in Washington State. This grant supports a collaborative effort among these five youth service providers to offer flexible funding to more quickly end the crisis of homelessness for young people. The project also supports the development of the Youth Worker’s Institute, skills development training for providers, and peer learning across agencies.